Commissioned by: Phil Roberts, Andrew Robson, Andy Cooper. Whilst making this film, Benjamin and producer Alistair Miskin visited all sixty stations on the Metro network. Highlight of the filming period has to be the all-night shoot at Gateshead Station complete with trains. You’ve not lived until you’ve stood on a metro platform amongst 200 dancing Geordies and Mackems! The period Benjamin spent in Newcastle is one of the happiest of his life during one of the coldest British winters on record. He met a set of inspiring people, and discovered an area that he very much fell in love with. Tyne Mouth has shot into his top ten favourite places in the UK. The three-day shoot was relaxed and fun, and Benjamin was supported by an exceptional team from BBC Newcastle. 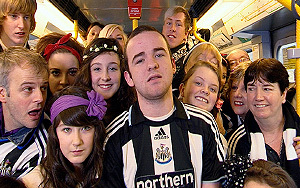 Photos show Newcastle fans on the Metro and the Metro depot. Commissioned by BBC Newcastle and performed by the people of Tyne and Wear. Tyne and Wear Metro: The Musical celebrates Newcastle's premier transport network. The work features close to 200 performers from the region, who auditioned in various shopping centres across the North East. They formed two choirs, one of whom sang the names of all 30 stations of the "Coastal Loop" in glorious four-part harmony. The finished work celebrates 1980, the year that the Metro trains started running. The Winner Takes it All by ABBA was at number one on the official opening day, so Benjamin very subtly quoted five ABBA songs within his piece. The song begins with the wonderful Northumbrian piping of Chris Ormston. The backing track for the work was recorded in DIN Studios, London by Julian Simmons. All North-East-based singers, musicians and rapper dancers were recorded in a series of sessions at the Sage, Gateshead in February 2010. The track was mastered by Denis Blackham. 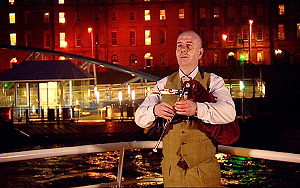 The accompanying film was premiered on Look North during March 2010, with an official premier happening at the Sage, Gateshead on Thursday March 24th.